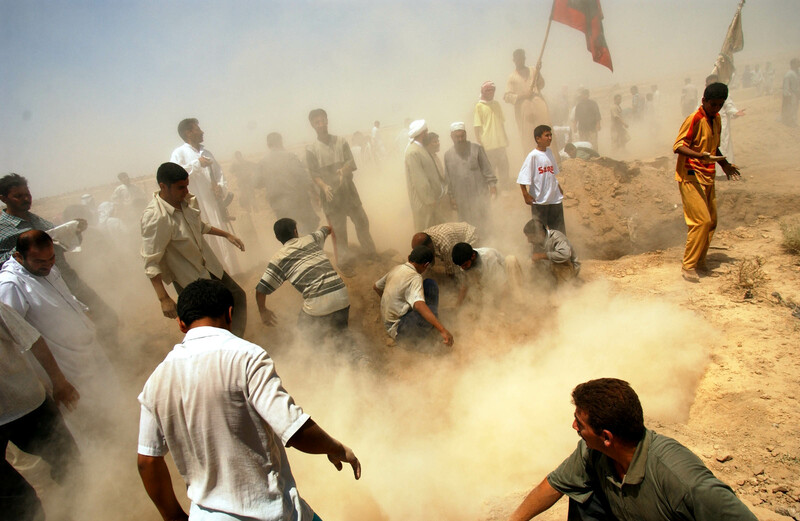 Iraq men bury the bodies of five men allegedly killed in an explosion in a mosque in Fallujah, some 30 km west of Baghdad, July 1, 2003, in Iraq. Iraqis in Fallujah claim that American forces dropped a missile on the mosque around 11pm the night before, and the case is currently under investigation. Tensions continue to rise as Iraqis grow more disillusioned with the American occupation of Iraq: attacks against coalition forces increase daily, and Americans troops are detaining and accidentally killing innocent Iraqis in tandem with the increase of attacks against them.